The dark side of living in a motor home. When I took this photo today my first thought was to post something about our motor home being the ‘pot of gold’ at the end of the rainbow. After more thought, and looking at the photo on my computer, I decided instead to share some of the drawbacks or dark sides of living in a motor home. It felt like a perfect fit for the photo…until I began to write the blog in my head. What should I complain about? The motor home being smaller than my former house? The constant battle I have with the boys leaving their dirty cloths everywhere? School books not being put away? Dirty shoes? Laundry? Dishes? All of these are true, plus more. But every time I started the list again I realized there was nothing different to complain about while living in the motor home than I would have done when I lived in my house. Wait. I just thought of one. Shopping. I do find myself sometimes standing in a store (Best Buy was the last one) saying, “It seems like I should buy something…” but I have nothing I need. Can I complain about that? I am so aware of what I have, where it is, and what I really need that I am not tempted to buy…but part of me still thinks they won’t let me out of the store if I don’t spend money, lol. For me, living in a small house is like cleaning out a large purse and swapping it for a smaller one. At first it seems like you will never fit all you ‘need’…but later after you made the switch you wonder what it was that you had filling that huge old purse. Maybe that is why when I look at the photo my first thought was to write about the pot of gold. I can see how other people could focus on the dark cloud but I’m guessing they would do that in most situations. ← First keep peace with yourself, then you can also bring peace to others. We loved your post. We’re looking to go full time and keep seeing articles about the negatives of full timing and we keep saying the same things to ourselves that you bring up in your post. Great job! Loved the purse analogy! So true!! We have lived in e motorhome for 18 months. We wished we would have done it sooner. Love it. Never moving to a reg. house. just purchased a 5th wheel with a slide. That will be nice. i have two storage units of stuff. Thought we might need all that stuff. We dont so slowly getting rid of it. I look at things in stores also, but we dont need anything. Just hanging out in our fort. 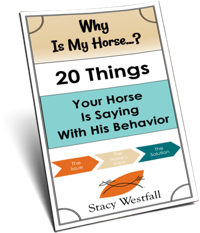 I’m living in a dream of a house (log ski lodge) with a dream of a stable (STB race track and professional stable for 12 horses) and I sometimes go shopping and feel I have to buy to avoid evil eyes while leaving. I’m a notorious window shopper, lol, so I understand where you are coming from. Small home or big home, nothing would change for me either except looking out the window with different scenery each day. Now that is a positive dream sign in my books. It is a great life you’re living this year. Enjoy it to the hilt! Some agility people do the same thing traveling all over in their RV’s for dog agility trials. 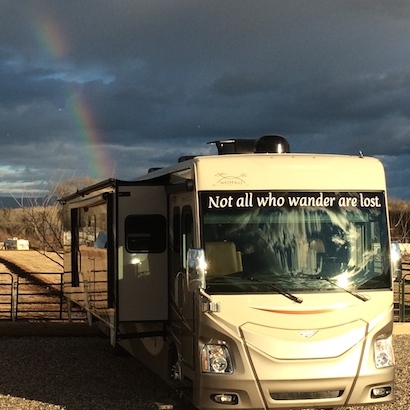 I love how it looks that the RV is at the end of the rainbow. I recently saw a double rainbow for the first time in my life and felt so blessed for that moment. It sounds liberating to know that you’re not controlled by all the hype to buy stuff that clutters our lives and a bit weird at the same time as buying stuff has been so ingrained in our psychic. 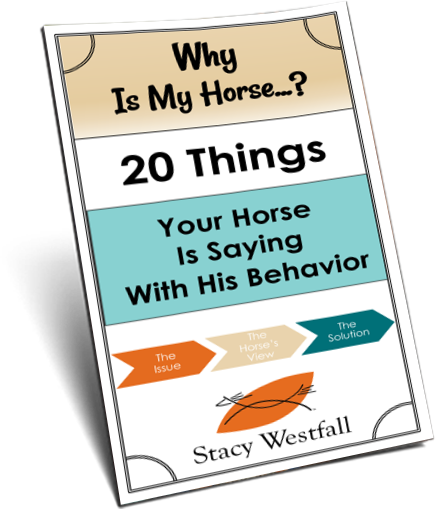 Love the insights you share into life and of course horses. We don’t live in a camper but do have one that we use a lot. I finally have my husband trained that everything has a place in the camper & everything needs to be in its place. Maybe someday your boys will realize that too. Continue enjoying your life, Stacy. You are now part of the Tiny House Nation! See the FIRST thing I seen was the RV at the end of the rainbow 🙂 You are living my dream!!! Thank you. Sometimes I need a reminder . The boys will be gone way sooner than you would ever want. Dirty clothes won’t matter. Every second you have with them. It goes away much to soon.